The Bush Buddy Tug-a-Jug is a non-toxic rubber and plastic interactive toy with a multi-sensory appeal to keep your dog engaged and motivated. The unique design of the toy allows your dog to see, hear and smell the treats as they move about inside the jug. 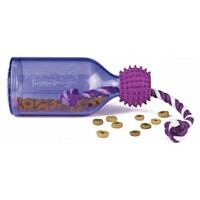 Eventually the dry food or treats will pop out as your dog tips, tugs and rolls the toy around. The Tug-a-Jug is perfect for obedience training and for feeding meals. This is a really ingenious treat dispensing toy. Only the cleverest problem solvers will work it out, really great for intelligent dogs. Just make sure the treats are small enough to come out of the hole, there is not room for larger bits to come out. Small bite kibble or tiny treats work best.